Most of the time, the Dark Energy Camera in Chile stares out into the deepest regions of space, measuring light from distant galaxies. But this gigantic eye sometimes discovers things closer to home—like the 11 newly found stellar streams that the Dark Energy Survey announced today. For a few lucky groups in Chile and Australia, this meant an extraordinary opportunity: getting to name an object in space. “The people were very enthusiastic,” says Kyler Kuehn, a scientist with the Dark Energy Survey who coordinated the outreach effort in Australia. “I don’t know if they are aware how rarely people get to name things that are newly discovered in space—or anywhere, for that matter—but I was pretty excited about it." Stellar streams are ribbons of stars orbiting a galaxy (in this case, our own Milky Way). These faint filaments are the remnants of dwarf galaxies or star clusters that have been ripped apart by the gravity of their monster neighbor. Unlike some celestial objects that have very specific naming conventions according to the International Astronomical Union, stellar streams have a bit of flexibility. Previously discovered stellar streams were often named after constellations in the sky near their location—but with many streams often appearing close to one another and other objects such as dwarf galaxies using the same convention, things became messy. Carl Grillmair, a CalTech astronomer studying stellar streams, proposed using the names of rivers in Greek mythology, like the River Styx. From there, naming expanded into real-world rivers. DES decided to go the terrestrial route. One set of stellar streams, located in the sky near the Indus constellation, received names of Indian rivers: Indus, Jhelum, Chenab and Ravi. The collaboration decided to name the other two groups of streams after native words relating to water or rivers in Chile, where the Dark Energy Camera is located at the Cerro Tololo Inter-American Observatory, and Australia, where the Anglo-Australian Telescope is often used to follow up on those DECam discoveries. In Chile, DES worked with students in the nearby town of Vicuña. 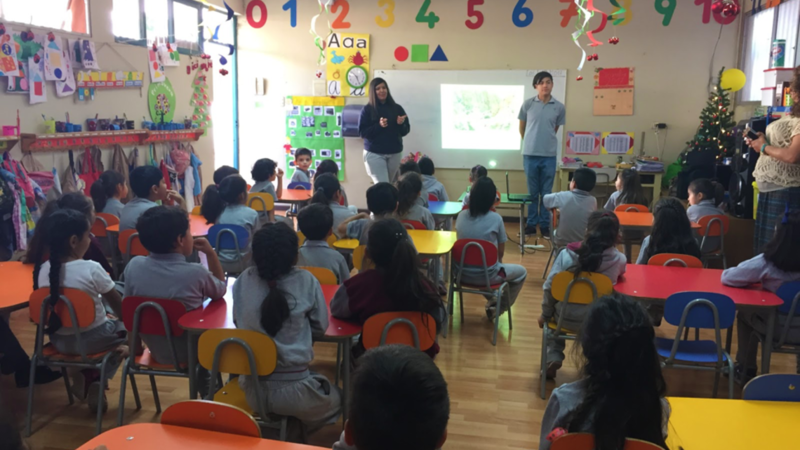 High school students Dánae Rojas and Emerson Carvajal researched words from the native Quechua and Aymara cultures that were related to water, then presented several options to about 90 kindergarten and first-grade students. Their final selections were the Aymara name Aliqa Una, meaning Quiet Water, and two Quechua names, Palca, meaning Crossing Rivers, and Willka Yaku, or Sacred Water. Two Spanish names for local rivers near Vicuña, Elqui and Turbio, rounded out the set. In Australia, Kuehn worked with an Aboriginal storyteller and tribal elders to pick culturally sensitive and appropriate names in native languages. With a list of half a dozen names, Kuehn presented to a group of about 100 raucous adults at the Sydney Royal Botanic Gardens and 40 polite preschoolers, asking them to cheer to select their favorites. The Australian-named stellar streams are Wambelong, meaning Crazy Water in the Gamilaraay language, and Turranburra, the Dharug name for the Lane Cove River that runs near the headquarters of the Australian Astronomical Observatory. Scientists hope the names build connections between the nations that host the observatories and the discoveries they make about the universe that hosts us all. “It was wonderful to see the community have a chance to write in the sky,” Zenteno says. Editor's note: You can learn more about the stellar streams and the accompanying release of three years of data from the Dark Energy Survey's lead lab, Fermilab.